7,908 lists from 1,105 birders, with 785 species in total – that’s the impressive headline from 4 days of birding for this year’s GBBC in India. A total of 5,938 hours were spent birding, across 34% of districts nationwide, by experienced birders and newcomers, from sites as diverse as national parks and wildlife sanctuaries, village tanks and parks, and more than 130 institutional campuses as part of the Campus Bird Count. The Great Backyard Bird Count runs for 4 days every February. The idea is to encourage people to go birding anywhere, even their backyards, and record their observations on the eBird website. In 2013 India participated in the event when it became global for the first time. This year one focus has been to share birding with others, even non-birders, and the 1,105 who took part in India proves this to be a great success. Compared to last year, 2016 experienced an increase in effort, with 23% more participants spending 37% more time in the field, and recording 8% more lists and 50 more species. Effort this year was also greater than 2014 when both GBBC and Big Bird Day took place over the same weekend. This is all great to see, and we hope this trend continues. 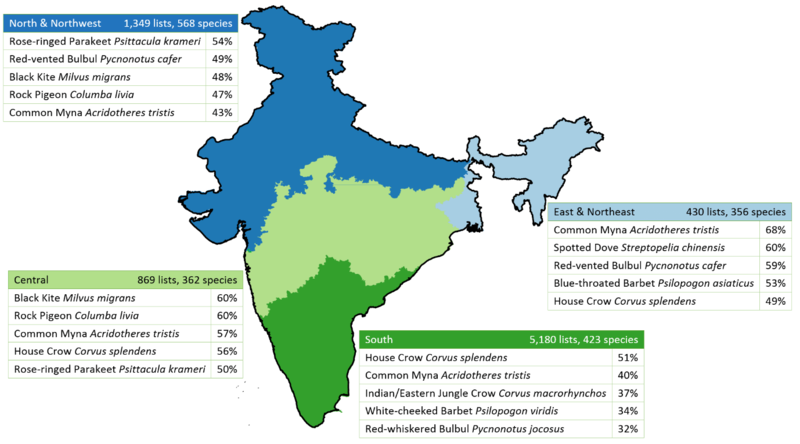 The diversity of birdlife in India is illustrated by the fact that we recorded more species than any other country, ahead of both Columbia and Ecuador, despite less effort spent in the bird-rich northeast than during the past two years. NB: Number of lists shown differs from that used for analysis, as the GBBC total includes lists of any duration, as well as late-arriving lists, whilst GBBC India analysis has only considered complete lists of at least 15 minute duration uploaded by the cut-off date of 1 March 2016. See the full country breakdown by checklists on the eBird GBBC website. See the full country breakdown by species on the eBird GBBC website. Lists were recorded from 30 states and union territories, and 219 (34%) districts nationally. Each list is shown in the map as a translucent circle: darker areas therefore represent multiple lists from the same or adjacent locations. The most commonly encountered species vary somewhat across regions, as depicted below. Common Myna appears in the top five for each of the four regions, with House Crow being the only other species to make the top five in more than two regions. The two Barbets, Blue-throated and White-cheeked, are notable for only occurring in two of the four regions nationwide, but being encountered so frequently as to make the top five in one region each, East & Northeast and South respectively. Unsurprisingly those states that had most effort typically recorded more species, although certain states that have a wide range of habitats, e.g. Uttarakhand, Gujarat, Rajasthan, Himachal Pradesh, proved to be especially species-rich with less birding effort. 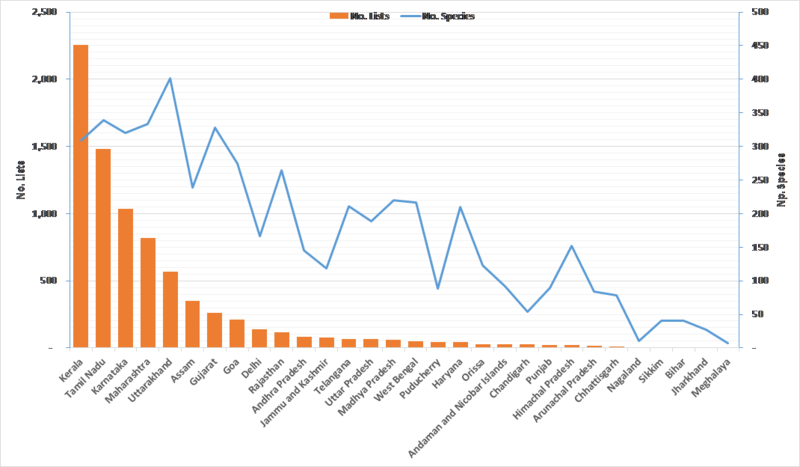 The number of lists and species per state are shown in the graph below. Nationally 1,105 birders took part. This number is those who actually registered with eBird and have at least one list recorded: the actual number of participants who accompanied them, especially via organised bird walks and the Campus Bird Count, would be much higher. Across India, some individual participants deserve credit for their efforts. Listed here are those who completed the most qualifying lists, and dedicated the most time. These efforts are particularly noteworthy on a global scale: five of the top ten participants in the world in terms of checklists submitted were from India, and Indians were the top five globally for number of species recorded! As interesting as the statistics are, it is also great to hear some personal accounts of how people were inspired by birding during GBBC. Who knew one Saturday morning could turn out to be such a blissful one, I am new in the field of bird watching, but it gives me immense joy when I spot birds. The images of those flamboyant birds will forever float in front of my eyes; I feel lucky that I could be a part of this event and would always look forward for many events such as this. I felt privileged to be able to represent my tiny portion of the Himalayas in an exercise with the global significance of the GBBC. I can’t think of a better use for a long holiday weekend, and look forward to participating again next year. The last quote raises an interesting point about “my tiny portion” – no matter how large, or bird-rich, an area may be, it is often detailed observations from the same location over a period of time that provide the most interesting data, so please continue eBirding at sites you visited during GBBC! As part of the GBBC India the Campus Bird Count also took place. This is an important exercise for documenting birds in places that can be overlooked but often provide valuable habitat, as well as introducing many young newcomers to birdwatching and monitoring. Campuses may belong to educational and training institutions of any kind, government institutions, research stations, corporate campuses or even residential campuses and colonies. Overall more than 32% of the GBBC lists were from the Campus Bird Count. Those institutions that completed the most lists are shown in the table below. We are grateful for the various people who acted as state coordinators, helping with the various campuses in their area. The success of the event, particularly for those new to bird recording, was obvious, as can be seen in these quotes from participants. I don’t regret missing out on the University level cricket match which was scheduled on the same dates. It was a wonderful experience to be a part of such an enthusiastic birding team. Thank you for organizing this event on our campus and for the wonderful planning work. With the help of some university students of Jammu we started the count process on a foggy morning at around 8.30 in the morning. More and more students joined in the later hours. The activity was filled with fun and excitement especially the student showed much interest in knowing and recording the names of species new to them. Visit the Campus Bird Count Results webpage to browse the full data. The theme of this year’s photo contest was “Birds and People”, perfectly captured by Avishkar Munje’s winning entry of a posing White-throated Kingfisher amusingly titled “A rare sight: Students observing ‘feathered’ birds in Fergusson”. 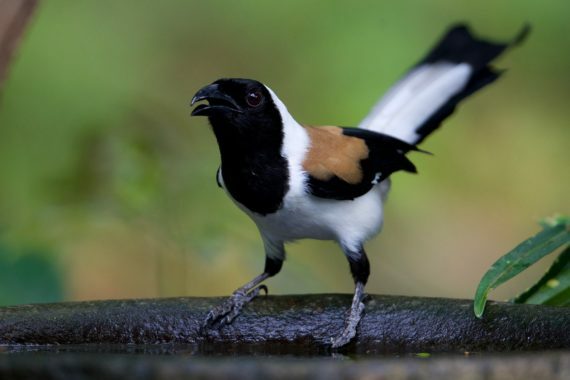 Thanks to our illustrious judging trio of Ramki Sreenivasan, Rathika Ramasamy and Sumit Sen for choosing this from all the entries, which you can see in the Birds and People Gallery. GBBC 2016 was coordinated by Bird Count India and its various partners. For more information, see the following links. Thanks to the 1,085 participants who have lists on eBird to show for their efforts during GBBC 2016, and of course to the many more who accompanied them on their birding walks. Hopefully GBBC has inspired everyone to pay attention to the birds around them. Mark your calendars now for 17-20 February 2017 and GBBC 2017, but do keep eBirding regularly in the meantime! Back to the GBBC 2016 home page.